Abstract: The association between interleukin-33 (IL-33) gene polymorphisms and late onset Alzheimer’s disease (LOAD) remains controversial in previous studies. Thus, a meta-analysis was conducted to assess the association between the IL-33 polymorphisms (rs11792633 and rs7044343) and LOAD susceptibility. Crude odds ratio (OR) and 95% confidence interval (CI) were used to investigate the relationship strength. Sensitivity analysis was performed, and publication bias was estimated by the Begg’s and Egger’s tests. Overall, six independent studies involving 2,589 patients and 8,414 control samples met our inclusion criteria and were included in this meta-analysis. The results showed that IL-33 rs11792633 polymorphism had statistically significant correlation with a decreased risk of LOAD in heterozygous comparison model (OR =0.64, 95% CI =0.48–0.83), homozygote comparison model (OR =0.83, 95% CI =0.74–0.93), dominant model (OR =0.78, 95% CI =0.67–0.91), recessive model (OR =0.70, 95% CI =0.59–0.84), and allelic model (OR =0.79, 95% CI =0.69–0.91), which were also validated by stratified subgroup analysis. Additionally, there was an apparent association between the IL-33 rs7044343 variant and LOAD risk under four genetic models for overall population (heterozygous comparison model: OR =0.75, 95% CI =0.63–0.89; dominant model: OR =0.83, 95% CI =0.70–0.98; recessive model: OR =0.80, 95% CI =0.68–0.94; allelic model: OR =0.86, 95% CI =0.79–0.94) as well as Caucasian subgroup. In summary, our meta-analysis implicated that IL-33 gene polymorphisms rs11792633 and rs7044343 were significantly associated with the susceptibility of LOAD. Growing evidence has proven that Aβ deposition initiates a spectrum of cellular responses mediated by the activated microglia, which produce inflammatory cytokines to further trigger the immune response, induce neuronal loss, and aggravate AD pathology.7 The interleukin-1 (IL-1) cytokine family is recognized as a key mediator of inflammation and fibrosis in multiple tissues.8 Interleukin-33 (IL-33), a member of IL-1 family, plays a pivotal role in immune responses and various physiological and pathological events such as tissue homeostasis, autoimmune disease, and cancer.9,10 IL-33 acts as an alarmin against stress and cell death by activating immune cells to enhance cellular immune response and to maintain homostasis.11,12 In the central nervous system, IL-33 was suggested to induce inflammatory molecules released from glial cells; furthermore, IL-33 administration could reduce soluble Aβ levels and amyloid plaque deposition by promoting the recruitment and Aβ phagocytic activity of microglia in AD.13,14 Therefore, mutations of IL-33 gene possibly result in an aberrant deposition of Aβ and thus promote the pathogenesis of AD. Late onset AD (LOAD) is AD diagnosed at and after the age of 65 years. LOAD is a common form of AD, accounting for >90% of all AD cases. It is of great significance to elucidate the possible pathogenesis of LOAD. Over the years, although some epidemiological studies have been performed to investigate the association between LOAD risk and the IL-33 gene polymorphisms, the results still remain conflicting. Several single-nucleotide polymorphisms (SNPs) within IL-33 have been suggested to affect the gene expression levels including rs11792633, rs7044343, and rs1157505 polymorphisms. Interestingly, the SNPs of IL-33 were reported to be involved in the LOAD susceptibility.15–17 Although the IL-33 gene rs1157505 polymorphism was reported to be an widely accepted factor of AD susceptibility, it is still inconclusive that whether the rs11792633 and rs7044343 polymorphisms of IL-33 gene affect the risk of AD. The study by Yu et al17 indicated that rs7044343 was not a genetic factor of AD, and the American participants in the Chapuis et al’s15 study also showed that rs11792633 polymorphism of IL-33 had negative effect on AD risk. It means that finding out the association between LOAD pathogeneses may serve as an important target for AD pathogenesis. Therefore, we perform a meta-analysis to evaluate the association between the IL-33 gene polymorphisms rs11792633 and rs7044343 and the risk of LOAD. The publication search was carried out in multiple electronic databases including PubMed, EMBASE, Web of Science, and AlzGene with a combination of the following subject terms: “IL-33” or “interleukin-33” or “rs11792633” or “rs7044343” and “Alzheimer’s disease” or “AD”. The relevant articles published in English before March 1, 2017, were included. The abstracts found were read to conform studies examining the genotype association between IL-33 SNP and AD. The study was considered eligible and included in the current meta-analysis if it met the following criteria: 1) case–control or cohort study design; 2) the study had to be focused on SNP rs11792633 or rs7044343 within IL-33 using original data; 3) the study included sufficient genotype distribution data such as the frequency of individual genotypes in cases and controls; and 4) the LOAD cases (age at onset ≥65 years) were diagnosed according to the National Institute of Neurological and Communicative Disorders and Stroke and the Alzheimer’s Disease and Related Disorders Association (NINCDS–ADRDA) or Diagnostic and Statistical Manual of Mental Disorders (DSM)-III criteria, which are worldwide working criteria for AD diagnosis.18,19 The studies without correlation with IL-33 polymorphism and LOAD susceptibility, overlapping data, or review articles were excluded. Each study was independently checked with inclusion and exclusion criteria by two investigators, and a consensus was reached. The following information was extracted from each study: first author, publication year, country, ethnic origin, mean age and the percentage of women of the studied population, genotyping method, and sample size distributions of genotype and allele. The following genetic models were selected: homozygote comparison model (NN vs MM), heterozygous comparison model (MN vs MM), dominant model (NN + MN vs MM), recessive model (NN vs MN + MM), and allelic model (N vs M) (M stands for major allele and N stands for minor allele). The strength of the association between IL-33 polymorphisms and LOAD risk was expressed by crude odds ratio (OR) and the corresponding 95% confidence interval (CI). The significance of the pooled OR was detected by Z-test, and two-tailed P-values <0.05 were considered statistically significant. The between-study heterogeneity was determined by Cochran’s Q statistic and the I2 statistic, and the value of I2≤50% and P>0.1 indicated low heterogeneity, and using fixed-effects model, otherwise, the random-effects model was conducted.20,21 Hardy–Weinberg equilibrium (HWE) in the controls was tested using the Pearson’s chi-squared test, and the significance level was maintained at P<0.05.22 Additionally, Begg’s funnel plot and Egger’s linear regression test were performed to estimate the possible sources of bias, and P<0.05 was considered representative of statistically significant.23 All the abovementioned statistical analyses were carried out using the STATA 12.0 software (StataCorp LP, College Station, TX, USA). A total of 44 published articles referred to the association between IL-33 rs11792633 or rs7044343 variants and LOAD were eligible for this meta-analysis after an initial search from the PubMed, EMBASE, Web of Science, and AlzGene databases. After further screening of these studies, six case-control studies out of three publications were included in the analysis, and the potential genetic associations between two cytokine gene polymorphisms IL-33 rs11792633 and rs7044343 and LOAD susceptibility were comprehensively investigated. All studies used the Mini–Mental State Examination (MMSE) to identify healthy controls.24 The median age of LOAD cases in these studies ranged from 73.0 to 79.6 years (age at onset >65 years), and the percentage of female patients ranged from 55% to 65%. The methods for gene identification were the polymerase chain reaction-restriction fragment length polymorphism (PCR-RFLP). The flow diagram of the search process is shown in Figure 1, and the general characteristics and genotype distributions of the IL-33 alleles are listed in Table 1. Figure 1 Flow diagram of search strategy and study selection for meta-analysis. Abbreviations: AD, Alzheimer’s disease; IL-33, interleukin-33. Note: PHWE, P-value of HWE. Abbreviations: 3C, three-city; ADRDA, Alzheimer’s Disease and Related Disorders Association; DSM, Diagnostic and Statistical Manual of Mental Disorders; HWE, Hardy–Weinberg equilibrium; IL-33, interleukin-33; MMSE, Mini–Mental State Examination; NINCDS, National Institute of Neurological and Communicative Disorders and Stroke; PCR-RFLP, polymerase chain reaction-restriction fragment length polymorphism. The association between IL-33 rs11792633 polymorphism and LOAD risk was analyzed in six independent studies encompassing 2,589 cases and 8,414 controls. Results of pooled analysis are summarized in Table 2. Fixed-effects model was used in homozygote and recessive models, while random-effects model was conducted in heterozygote model, dominant model, and allele model. Overall, the pooling estimates showed a clear reduction of the risk of developing LOAD in heterozygous comparison model (TT vs CC: OR =0.64, 95% CI =0.48–0.83, I2=47.5%), homozygote comparison model (CT vs CC: OR =0.83, 95% CI =0.74–0.93, I2=20.4%), dominant model (CT + TT vs CC: OR =0.78, 95% CI =0.67–0.91, I2=46.3%), recessive model (TT vs CT + CC: OR =0.70, 95% CI =0.59–0.84, I2=36.7%), and allelic model (T vs C: OR =0.79, 95% CI =0.69–0.91, I2=62.0%). Subsequent analysis accounting for ethnicity revealed the similar results in Caucasian populations as our results in Han Chinese population, using four genetic models except the recessive model. Decreased LOAD risk was also observed in Asian except for the homozygote model. Pooled ORs and 95% CIs for the association of IL-33 rs11792633 SNP with LOAD risk are shown in Table 2, and the forest plots for the association between the IL-33 rs11792633 SNP and LOAD risk in dominant and recessive models for overall populations and ethnicity subgroup are shown in Figure 2A–D. Note: P-value <0.05 was considered statistically significant. Abbreviations: CI, confidence interval; IL-33, interleukin-33; LOAD, late onset Alzheimer’s disease; NA, not applicable; OR, odds ratio. Figure 2 Forest plots of IL-33 rs11792633 SNP and LOAD risk. Notes: (A) Dominant model (CC vs TT + CT) for overall population; (B) recessive model (TT vs CT + CC) for overall population; (C) dominant model (CC vs TT + CT) for ethnicity subgroup; and (D) recessive model (CC vs TT + CT) for ethnicity subgroup. Each square represents an OR for each specific study, with square sizes proportional to the weight. Weights are from random-effects analysis. Abbreviations: CI, confidence interval; IL-33, interleukin-33; LOAD, late onset Alzheimer’s disease; OR, odds ratio; SNP, single-nucleotide polymorphism. A sensitivity analysis was conducted in which every single study was excluded to explore the potential sources of heterogeneity. However, sensitivity tests revealed that no single study significantly affected the estimates of overall results, indicating a high stability of this meta-analysis. Moreover, Begg’s funnel plot and Egger’s linear regression test were performed to assess publication bias of all included studies. As shown in Figure 3A and B, the shape of funnel plots for meta-analysis of IL-33 rs11792633 SNP in the included studies under dominant and recessive models seemed symmetrical, and Egger’s tests also failed to present the evidence of publication bias (Table 2). Figure 3 Begg’s funnel plot analysis for publication bias between IL-33 rs11792633 SNP and LOAD risk. Note: (A) Dominant model (CC vs TT + CT) and (B) recessive model (TT vs CT + CC). Abbreviations: SE, standard error; IL-33, interleukin-33; LOAD, late onset Alzheimer’s disease; SNP, single-nucleotide polymorphism. A total of five relevant studies, consisting of 2,409 cases and 8,160 controls, were examined for the association between the IL-33 rs7044343 polymorphism and LOAD risk. The combined analysis revealed a significantly decreased risk of LOAD for this mutation in the following four genetic models: heterozygous comparison model (CC vs TT: OR =0.75, 95% CI =0.63–0.89, I2=15.0%), dominant model (CT + CC vs TT: OR =0.83, 95% CI =0.70–0.98, I2=52.6%), recessive model (CC vs CT + TT: OR =0.80, 95% CI =0.68–0.94, I2=0.0%), and allelic model (C vs T: OR =0.86, 95% CI =0.79–0.94, I2=43.4%). Fixed-effects model was conducted in heterozygote, recessive model, and allele models, and random-effects model was used in homozygote and dominant models. Additionally, results of subgroup analysis stratified by ethnicity suggested that there was apparently positive association between the IL-33 rs7044343 and a reduction of LOAD susceptibility in Caucasians. Results of pooled analysis are summarized in detail in Table 2, and forest plots in dominant and recessive models are shown in Figure 4A and B. Figure 4 Forest plots of IL-33 rs7044343 SNP and LOAD risk. Notes: (A) Dominant model TT vs CC + CT and (B) recessive model CC vs CT + TT. Each square represents an OR for each specific study, with square sizes proportional to the weight. Weight are from random-effects analysis. Abbreviations: IL-33, interleukin-33; LOAD, late onset Alzheimer’s disease; OR, odds ratio; SNP, single-nucleotide polymorphism. Sensitivity analysis indicated that no single study qualitatively changed the pooled ORs, suggesting that the results of the meta-analysis were stable. Funnel plots were conducted to assess the publication bias, and no evidence of asymmetry was observed, which was further supported by Egger’s tests (Table 2). The funnel plots for dominant and recessive models were shown in Figure 5A and B, showing that there was no publication bias in our study. Figure 5 Begg’s funnel plot analysis for publication bias between IL-33 rs7044343 SNP and LOAD risk. Note: (A) Dominant model (TT vs CC + CT) and (B) recessive model (CC vs CT + TT). Abbreviations: IL-33, interleukin-33; LOAD, late onset Alzheimer’s disease; SNP, single-nucleotide polymorphism. IL-33 is a proinflammatory cytokine of the IL-1 family, and the IL-33 gene is located in the chromosome 9p24 region containing 11 exons. A genome-wide association study (GWAS) by Li et al25 found strong correlation between IL-33 polymorphisms and allergic rhinitis. Therefore, genetic variants of IL-33 have been investigated in numerous autoimmune diseases. So far, a multitude of IL-33 genetic variants has been identified, and several have been investigated for associations with IL-33 activity, such as IL-33 rs3939286, rs16924159, rs11792633, rs7044343, and rs1157505 polymorphisms. Among them, Lopez-Mejias et al26 suggested that IL-33 gene rs3939286 may be a candidate gene to the systemic sclerosis (SSc). IL-33 gene rs16924159 variant possibly contributed to the pathogenesis of idiopathic recurrent miscarriage in Han Chinese population.27 The rs7044343 and rs11792633 variants of IL-33 gene were related to a decreased risk of Behçet’s disease (BD).28 The IL-33 gene rs7044343 polymorphism was also associated with the susceptibility to SSc and rheumatoid arthritis (RA).29,30 Moreover, according to Kudinova et al,31 there existed a link between 2 SNP haplotypes in the IL-33 gene (rs11792633 and rs7044343) and mental disorder. Additionally, increasing evidence has accumulated to support the IL-33 SNPs’ crucial role in AD pathogenesis. According to previous studies, IL-33 induced inflammatory molecule release from the glial cells and mobilized innate immunity to reduce Aβ accumulation.13,14 To investigate whether rs11792633 or rs7044343 polymorphism in IL-33 produced a marked effect in mediating susceptibility to AD, several case–control studies had evaluated the role of the IL-33 gene in AD.15–17 The Tian study, the Yu study, and the Chapuis study except the American participants showed a positive association between IL-33 gene rs11792633 polymorphism and LOAD risk. Meanwhile, a potential role of IL-33 gene rs7044343 polymorphism in LOAD pathogenesis was reported in the Yu study and the Chapuis study, while the Tian study draws the opposite conclusion. However, all the results were only limited to specific European or Asian populations; it is necessary to identify whether any association exists between IL-33 polymorphism and LOAD risk in combined populations. Therefore, we performed this meta-analysis. Consequently, for overall comparison of pooled ORs, a significantly decreased risk was observed in almost all genetic models on the associations between IL-33 polymorphisms rs11792633 and rs7044343 and LOAD risk. Furthermore, the T allele of rs11792633 and the C allele of rs7044343 in IL-33 gene were found to be protective factors for LOAD in our meta-analysis. Sensitivity analysis was performed to assess the influence of each single study on the pooled ORs by removing individual studies, and the results suggested that no study significantly affected the pooled ORs of IL-33 rs11792633 and rs7044343 polymorphisms. Moreover, Begg’s funnel plot and Egger’s linear regression test were used to assess publication bias of all included studies. All of the P-values of Begg’s funnel plot were >0.05, indicating that the results of this meta-analysis were statistically robust. Furthermore, strong linkage disequilibrium in rs11792633 and rs7044343 SNPs was identified in the Yu study in which the minor alleles defined a protective haplotype.16 And as Chapuis et al suggested, a resulting protective haplotype including the rare alleles of the IL-33 gene rs1157505, rs11792633, and rs704343 SNPs was systematically associated with LOAD risk.15 However, we did not display the haplotype analysis because of the limited data. In a word, compared with the previous studies, although no significant differences were detected for the rs7044343 polymorphism between LOAD cases and controls in Han Chinese, we concluded IL-33 gene rs11792633 polymorphism to be a protective factor to LOAD in the total population, as well as the rs11792633 polymorphism, which will provide new strategies and new targets for LOAD treatment. In spite of the strengths of our study, there are some shortages and limitations to this meta-analysis. First, although we gathered all the eligible publications, the number of studies and subjects included in our meta-analysis was still small, causing an influence on the completeness of the data. Second, mild–moderate heterogeneity across included studies did exist in separate comparisons, which may influence the interpretation of our results. Third, the P-value of HWE of one included study was 0.05, suggesting that the distribution of genotypes in the controls deviated from HWE, and these study populations were not representative of the broader target population, which may lead to the instability of our result. Fourth, only one published study in the Asian origin was included in the meta-analysis of the IL-33 rs7044343 SNP, and the stratified analysis for Asians might not be reliable. Moreover, we did not account for some confounding factors such as age, gender, family history, and environment, or apolipoprotein E (ApoE) ε4 allele may participate in the association of IL-33 polymorphism and LOAD risk due to limited data. Based on the published studies, our meta-analysis confirmed that a significant association was existed between IL-33 rs11792633 and rs7044343 polymorphisms and a decreased LOAD risk. To better understand the role of IL-33 polymorphism in LOAD risk, further studies combined with multiethnic research are warranted to determine the value of IL-33 variants for LOAD. This study was supported by grants from Program for Liaoning Innovation Research Team in University (no LT2014016); Liaoning Province Scientific Research Foundation (2014226033); and Key Laboratory Foundation from Shenyang S&T Projects (F16-094-1-00). This study was also supported in part by the National Natural Science Foundation of China (nos 81501098 and 81603112) and the National Science and Technology Major Projects for “Significant New Drugs Development” (2013ZX09103001-003). Maresova P, Mohelska H, Dolejs J, Kuca K. Socio-economic aspects of Alzheimer’s disease. Curr Alzheimer Res. 2015;12(9):903–911. Kawabata S, Higgins GA, Gordon JW. Amyloid plaques, neurofibrillary tangles and neuronal loss in brains of transgenic mice overexpressing a C-terminal fragment of human amyloid precursor protein. Nature. 1992;356(6366):265. Maccioni RB, Munoz JP, Barbeito L. The molecular bases of Alzheimer’s disease and other neurodegenerative disorders. Arch Med Res. 2001;32(5):367–381. Scheff SW, Price DA. Synaptic pathology in Alzheimer’s disease: a review of ultrastructural studies. Neurobiol Aging. 2003;24(8):1029–1046. Babic T. The cholinergic hypothesis of Alzheimer’s disease: a review of progress. J Neurol Neurosurg Psychiatry. 1999;67(4):558. Hardy J, Allsop D. Amyloid deposition as the central event in the aetiology of Alzheimer’s disease. Trends Pharmacol Sci. 1991;12(10):383–388. Heppner FL, Ransohoff RM, Becher B. Immune attack: the role of inflammation in Alzheimer disease. Nat Rev Neurosci. 2015;16(6):358–372. Borthwick LA. The IL-1 cytokine family and its role in inflammation and fibrosis in the lung. Semin Immunopathol. 2016;38(4):517–534. Lu B, Yang M, Wang Q. Interleukin-33 in tumorigenesis, tumor immune evasion, and cancer immunotherapy. J Mol Med (Berl). 2016;94(5):535–543. Molofsky AB, Savage AK, Locksley RM. Interleukin-33 in tissue homeostasis, injury, and inflammation. Immunity. 2015;42(6):1005–1019. Cayrol C, Girard JP. IL-33: an alarmin cytokine with crucial roles in innate immunity, inflammation and allergy. Curr Opin Immunol. 2014;31:31–37. Theoharides TC, Petra AI, Taracanova A, Panagiotidou S, Conti P. Targeting IL-33 in autoimmunity and inflammation. J Pharmacol Exp Ther. 2015;354(1):24–31. Fu AK, Hung KW, Yuen MY, et al. 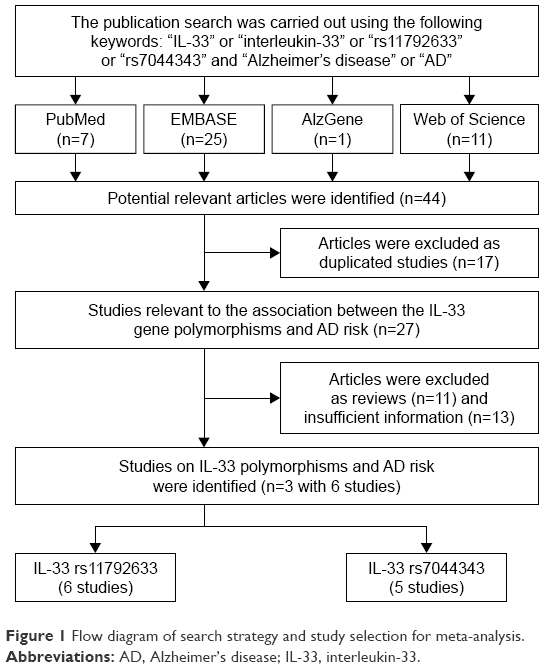 IL-33 ameliorates Alzheimer’s disease-like pathology and cognitive decline. Proc Natl Acad Sci U S A. 2016;113(19):E2705–E2713. Xiong Z, Thangavel R, Kempuraj D, Yang E, Zaheer S, Zaheer A. Alzheimer’s disease: evidence for the expression of interleukin-33 and its receptor ST2 in the brain. J Alzheimers Dis. 2014;40(2):297–308. Chapuis J, Hot D, Hansmannel F, et al. Transcriptomic and genetic studies identify IL-33 as a candidate gene for Alzheimer’s disease. Mol Psychiatry. 2009;14(11):1004–1016. Tian M, Deng YY, Hou DR, et al. 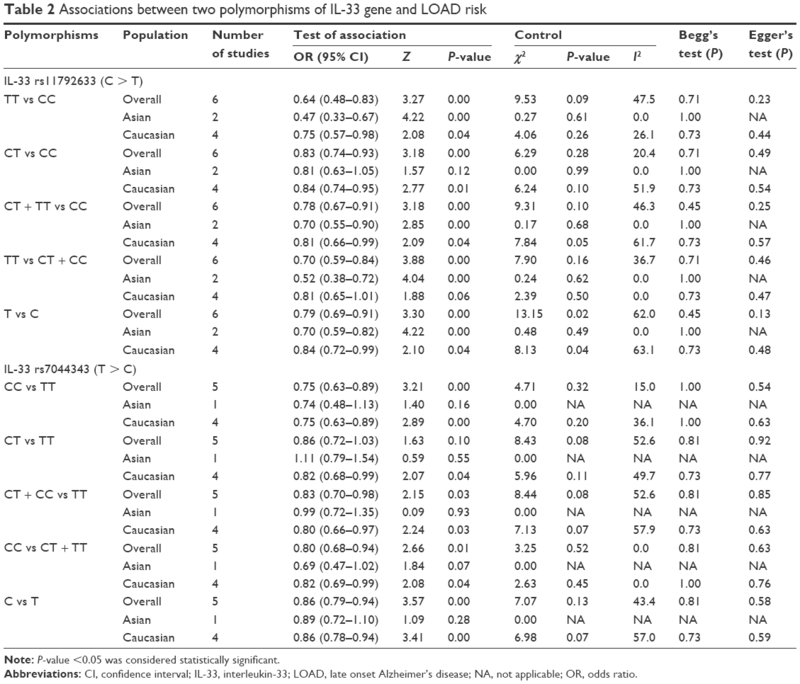 Association of IL-1, IL-18, and IL-33 gene polymorphisms with late-onset Alzheimers disease in a Hunan Han Chinese population. Brain Res. 2015;1596:136–145. Bovin MJ, Marx BP, Weathers FW et al. Psychometric properties of the PTSD checklist for diagnostic and statistical manual of mental disorders-fifth edition (PCL-5) in veterans. Psychol Assess. 2016; 28(11):1379–1391. McKhann G, Drachman D, Folstein M, Katzman R, Price D, Stadlan EM. Clinical diagnosis of Alzheimer’s disease: report of the NINCDS-ADRDA work group under the auspices of department of health and human services task force on Alzheimer’s disease. Neurology. 1984;34(7):939–944. Brittain EH, Fay MP, Follmann DA. A valid formulation of the analysis of noninferiority trials under random effects meta-analysis. Biostatistics. 2012;13(4):637–649. Higgins JP, Thompson SG, Deeks JJ, Altman DG. Measuring inconsistency in meta-analyses. BMJ. 2003;327(7414):557–560. Munafo MR, Clark TG, Flint J. Assessing publication bias in genetic association studies: evidence from a recent meta-analysis. Psychiatry Res. 2004;129(1):39–44. Song F, Khan KS, Dinnes J, Sutton AJ. 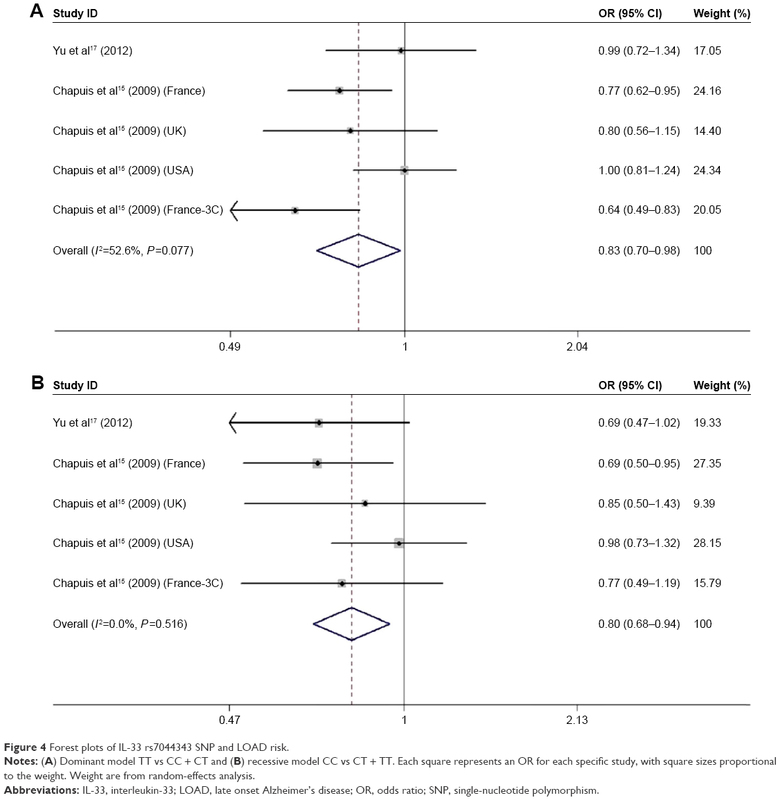 Asymmetric funnel plots and publication bias in meta-analyses of diagnostic accuracy. Int J Epidemiol. 2002;31(1):88–95. Folstein MF, Folstein SE, McHugh PR. “Mini-mental state”. A practical method for grading the cognitive state of patients for the clinician. J Psychiatr Res. 1975;12(3):189–198. Li J, Zhang Y, Zhang L. Discovering susceptibility genes for allergic rhinitis and allergy using a genome-wide association study strategy. Curr Opin Allergy Clin Immunol. 2015;15(1):33–40. Lopez-Mejias R, Genre F, Remuzgo-Martinez S, et al. Protective role of the interleukin 33 rs3939286 gene polymorphism in the development of subclinical atherosclerosis in rheumatoid arthritis patients. PLoS One. 2015;10(11):e0143153. Yue J, Tong Y, Xie L, Ma T, Yang J. Genetic variant in IL-33 is associated with idiopathic recurrent miscarriage in Chinese Han population. Sci Rep. 2016;6:23806. Koca SS, Kara M, Deniz F, et al. Serum IL-33 level and IL-33 gene polymorphisms in Behcet’s disease. Rheumatol Int. 2015;35(3):471–477. Koca SS, Pehlivan Y, Kara M, et al. The IL-33 gene is related to increased susceptibility to systemic sclerosis. Rheumatol Int. 2016;36(4):579–584. Li C, Mu R, Guo J, et al. Genetic variant in IL33 is associated with susceptibility to rheumatoid arthritis. Arthritis Res Ther. 2014;16(2):R105. Kudinova AY, Deak T, Hueston CM, et al. Cross-species evidence for the role of interleukin-33 in depression risk. J Abnorm Psychol. 2016;125(4):482–494.